We’ve somehow forgotten to mention one of the most important rules in the road trip handbook: Your voyage won’t always be planned. It was by this rule that we found ourselves relaxing on the couch one moment and driving the winding country roads — and we do mean winding — to the Maker’s Mark Distillery in Loretto, Kentucky, just a short hour and quick gas station Diet Coke and snack mix stop later. We had guests on this road trip. Some of our best friends were visiting Kentucky from England and we jumped at the chance to show them one of Kentucky’s proudest treasures: bourbon. There are few things greater than taking a spur-of-the-moment afternoon trip that requires very little travel, even less money, loads of information, lots of fun, a bourbon tasting … and manages to get you home by dinner time. 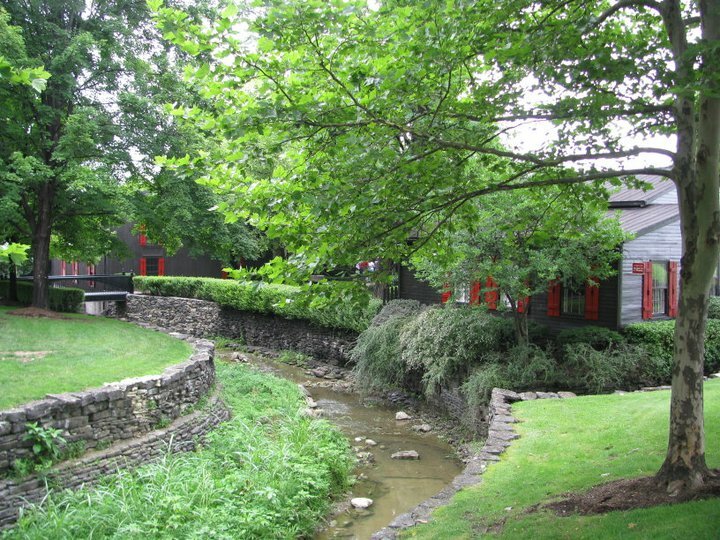 Our tour of the Maker’s Mark Distillery was a perfect Kentucky afternoon outing with our out-of-town friends. Bill Samuels, Sr. cooked up the first batch of Maker’s Mark in 1954 after tossing out his family recipe (Bill’s family had been bourbon makers for six generations) and replacing Rye with red winter wheat as the flavor grain. Learn more of the company’s history here. Bill may have been in charge of the recipe, but his wife Margie is largely responsible for the product you’ll find on liquor store shelves today. Margie was the brains behind Maker’s Mark marketing. She developed the shape of the bottle, the famous red-wax seal, the company logo and even the name ‘Maker’s Mark.’ Marg was a genius! Ever noticed the S IV symbol on a bottle of Maker’s Mark? Here’s what it stands for: The “S” is for the Samuels family. The “IV” is the Roman numeral four, representing which generation of Samuels created Maker’s Mark. At the time, Samuels thought he was the fourth generation of the Samuels family in Kentucky. It was later discovered he was actually the sixth, but it was too late to change the seal. And the star in the design is for Star Hill, the location on which the distillery sits. Maker’s Mark makes only two products: Maker’s Mark Bourbon and Maker’s Mark 46. The MM 46 product is just a couple of years old and is only a slight variation on the original bourbon. 46 is aged 2 to 3 months longer than Maker’s Mark (which is aged at least 6 and a half years) with French oak staves added to the interior of its aging barrel to give the drink a more woodsy and smoother taste. MM 46 is bottled at 94 proof — 4 points higher than Maker’s Mark — and is supposed to have a smoother and richer taste. The grain mixture used to make the bourbon must be at least 51 percent corn. It must be distilled to no more than 160 proof and bottled at at least 80 proof. The bourbon must go into the barrel for aging at no more than 125 proof. The bourbon must be aged for at least 2 years in a new charred, oak barrel. *Maker’s Mark note: MM has a contract with a company in Scotland who takes shipments of the used-once barrels and uses them to age scotch. 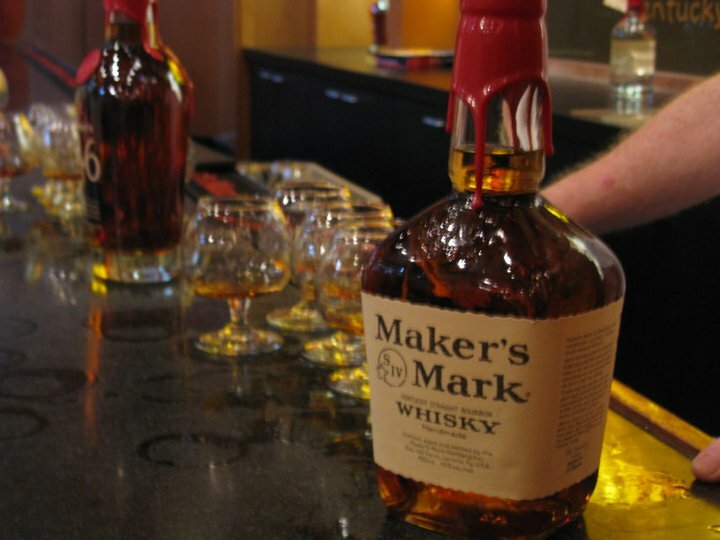 Learn more about the Maker’s Mark recipe and cooking process here. Not a thing! The distillery tours are free and start from the office every hour on the half hour 10:30 a.m. to 3:30 p.m. Monday through Saturday. Sunday tours go from 1:30 to 3:30 p.m. The distillery is open on holidays except for Easter Sunday, Thanksgiving, Christmas Eve, Christmas Day and New Year’s Day. To learn more about tours and hours, go here. In the gift shop, you get a do-it-yourself opportunity to dip a bottle of Maker’s Mark into the famous red wax! You must purchase the bottle first, they start at $18.95 and go up with the size of the bottle. Do you guys know how to get to Loretto? Yeah, neither did we. Turns out Google Maps took us on a “short cut” (Read: a very scary, tiny, two-laned country road that while swerving along Cameron declared, “I’m laughing so hard I’m crying! And I can’t see!” Oh we’re having fun now …) But once we figured out that we weren’t completely lost, the Maker’s Mark Distillery is actually pretty easy to get to from Bluegrass Parkway (Just see our map for directions). You can also find directions on the Maker’s Mark website.